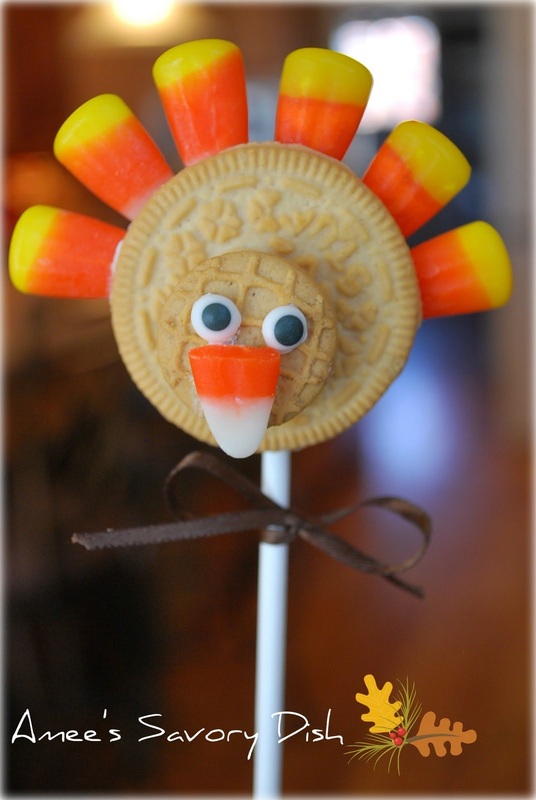 Turkey cookie pops are so incredibly cute! The perfect Thanksgiving treat. How cute is this little turkey?? I found the inspiration for these turkey cookie pops while browsing Pinterest (which I am completely addicted to) and wanted to make them for the kids. My daughter’s teacher wanted me to make a Thanksgiving snack with her class, so these treats would be perfect. Best of all, for those of you that don’t like to bake, they are made with ready made ingredients. Super easy peasy. Kids will have fun making these cookie treats. Gobble! Gobble! Attach 1 Nutter Butter cookie to 1 vanilla sandwich cookie using melted white chocolate as "glue". Dip the end of a lollipop stick in melted chocolate and insert into the bottom of a sandwich cookie. Attach eyes with melted white chocolate, then arrange candy corns around the top for the turkey feathers. Cut the end off of one candy corn and use melted chocolate to attach to Nutter Butter for his beak. Repeat steps for each turkey cookie pop. Wrap in cellophane and tie up with a ribbon, or eat immediately and enjoy. I think these are adorable and one of the simplest and cutest T’giving ideas I’ve seen. I always do a craft with my gr’kids and this would be easy for all ages. SO glad you shared! Wow..this is so cute & creative !! Hi Amee 🙂 I run Fun Family Crafts and am receiving some great search engine traffic to a feature I had on Heather Ann Melzer’s cookie pops. Unfortunately she has closed down her blog so I found yours and will be linking to you instead. Hope you don’t mind me sending the traffic your way instead! 😉 Here’s the feature http://funfamilycrafts.com/cookie-turkey-pop/ Thanks!